Shree Madhav Smaranam Ayurveda : Since 2007 - We Cure With Care,Naturally...! किसका पेट भरना चाहते है? Why Children are UNDERNOURISHED nowadays??? What is Authentic Ayurveda? How one can get it? In Ayurveda the heart is considered the “seat” of consciousness. The essential qualities of the heart are contained within this Sanskrit name – receiving, giving and moving. meaning in Ayurveda that it is an organ with a variety of important functions. The texts of Charaka go on to describe the heart as, “indispensable for all mental and physical activities,” because the entire sense perception, in total, depends on the heart. It is further described as Pranayatana —the seat of consciousness and the mind. 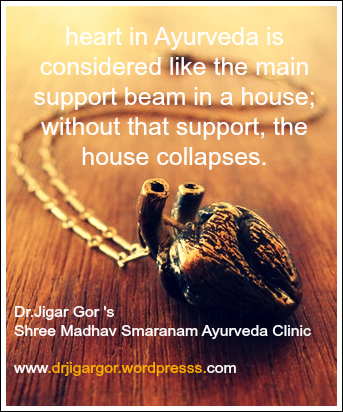 So important is the heart in Ayurveda that it is considered like the main support beam in a house; without that support, the house collapses. Ayurvedic therapies help restore the connection between heart, mind and self. They include dietary, herbal, behavioral and environmental tactics that allow one to become more established in Sattva – a state of stable, enduring balance and happiness – sometimes described as a field of bliss.